Anyone know a place to get good fish and chips? I used to go to Duke of Perth, but it's gotten too crowded and they stopped carrying Fullers ESB. Here are a few suggestions from a previous thread. There is a recent post here and an older post here. Another place, while not a restaurant, is Hagen's Fish Market who has a very good hand with fried fish. Do report back on what you tried and found you liked. Pepper Canister on Wells (between Grand & Illinois, I think, opposite SushiSambaRio) - excellent Irish pub, pretty decent food too. I can tell you where NOT to go: Grace O'Malley's. Probably the nastiest fish and chips I've ever experienced. crrush wrote: I can tell you where NOT to go: Grace O'Malley's. Probably the nastiest fish and chips I've ever experienced. I'll bet that they can't be worse than the F&C I had at Cherrystone's in New Lyme, CT Last weekend! Fuller's ESB is a very fine beer, indeed, but DoP does have Belhaven's Wee Heavy on draught, too, and it goes so well with their fish and chips. I've been to Grace O'Mally's. They have good burgers and appetizers, but I agree that their fish and chips is bad. The things I always liked about the Duke of Perth fish n' chips were the breading , the peas and the malt vinager. It's still a good place, I'm just annoyed about the crowds and the loss of Fullers. Thanks also for the tips on names to avoid (how about, the Wombat and the Lemur). Thanks for the tip on Hagen's. I'll check it out, but I'm looking for a pub-type place. JeffB has raved about the fish and chips at Ginger's Ale House. I finally tried it on his recommendation, last year, and I wasn't let down. Now, Ginger's is where I go to get my fix. Ginger's lost the toss for lunch today, so I went to D of P with La Professoressa. She had the F & C (All You Can Eat Wednesdays) and I had the Steak and Kidney pie, which the bartender tells me is getting 86ed in favor of "a Mexican standard, but with a Scottish treatment." Humidas de Haggis the way Robert Bruce liked 'em??? Both the fish and the organ meat pie were good, especially washed down with that tasty beverage, Wee Heavy Ale. I'll try Ginger's fish later this week. For now I'm still voting the Duke. Duke of Perth used to serve haggis on January 25th in honor of Robert Burns. The tradition is no more but the haggis lives on in my memory, where it should stay. Still, it was a fun tradition. Edgewater Tavern at 5600 north Ashland has very good fish-n-chips and a great beer selection, including 2-3 different draft beers from Rogue Brewing. The fish is thick chunks of Cod and the batter is crispy and airy. I don't know if F-n-C is on their regular menu, but they have a all-you-can-eat Friday Fish Fry for $9. griffin, are you sure they're using cod? At Duke of Perth today they were serving Alaskan pollack (mild like cod, maybe a little firmer, possibly cheaper, definitely more reliably available). I think we have different taste buds. I've had the Fish n' chips at Edgewater and I didn't think they were as good as Duke of Perth. EL'a batter was light and airy. I just wasn't wild about the flavor. That doesn't stop me from hanging out there. Edgewater is a great place. Have you seen the guy with the parrot that hangs out there? Choey wrote: griffin, are you sure they're using cod? At Duke of Perth today they were serving Alaskan pollack (mild like cod, maybe a little firmer, possibly cheaper, definitely more reliably available). No, I'm not sure it's Cod. It's the thinker cut with larger flakes I usually associate with Cod (particularly compared to the thin perch filets that many places seem to use). The fish was very thin filets (which I don't prefer for fried fish) of probably perch. They were overcooked, barely warm, and the batter was not crispy. My guess is they had been sitting around on top of each other for awile, steaming themselves and losing their crisp. I too enjoy Duke of Perth for fish and chips, mmm and then some Oban! yum, been too long. Choey wrote: Fuller's ESB is a very fine beer, indeed, but DoP does have Belhaven's Wee Heavy on draught, too, and it goes so well with their fish and chips. Thanks for the beer rec., Choey. The Wee Heavy does pair nicely with DoP's fish and (soggy) chips. 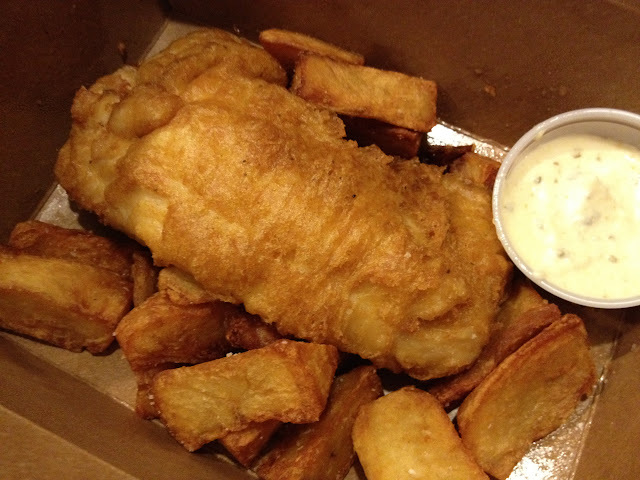 Lately I have been developing a craving to find a local source of my favorite fish and chips from home. In the Seattle area, I was able to get fish and chips done with a panko breading on halibut and salmon. I love F&C in almost any form but find the English style batters a bit heavy. The panko breading provides a nice crispy crunchy coating yet is very airy. The thick cut of the fish produces a finished product that is quite different from a thin tonkatsu. New England Seafood Company has joined Big and Little's as my go-to when in the mood for fish and chips. Moist flaky haddock, crisp greasless fry job and a nice size portion with fries for $10.95. Fish counter looked terrific, red mullet so fresh they were dancing in the case and the only, and first, bluefish I've seen in Chicagoland. New England Seafood Company, count me a fan! I should add I am anticipating adding Chief O'Neill's to my fish and chips lineup as soon as the Lake Effect takes hold. Big and Littles is the best I've had in Chicagoland for Fish and Chips. Not too greasy, cooked perfectly with consistency, nice piece of tilapia, and over some thin cut, crispy truffle fries, doesn't get any better than that! You might wanna try the Friday Fish n Chips special at Pleasant House Bakery. Completely deserving accolades are mentioned here. The attention to detail with this dish is pretty exceptional (perfectly fried pristine fish, lovely shallot? sauce, creamy chips, etc.). 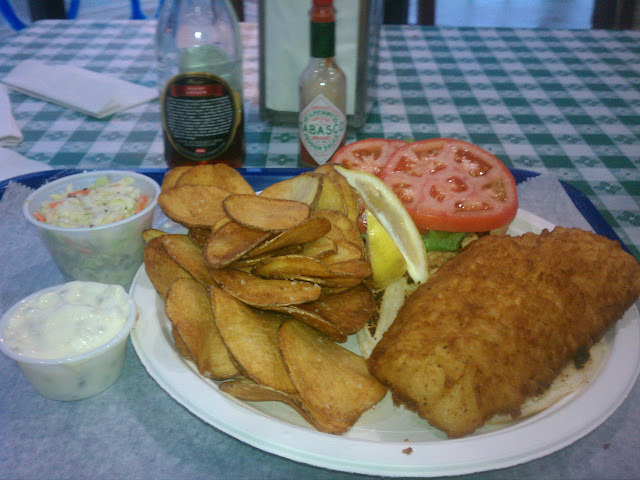 FoodSnob77 wrote: Big and Littles is the best I've had in Chicagoland for Fish and Chips. Not too greasy, cooked perfectly with consistency, nice piece of tilapia, and over some thin cut, crispy truffle fries, doesn't get any better than that! That was the largest tilapia fillet i've ever had in my life. I'm pretty sure they use cod and my only complaint is the amount of tartar they provide is laughable for such a massive piece of fish. PIGMON wrote: You might wanna try the Friday Fish n Chips special at Pleasant House Bakery. Completely deserving accolades are mentioned here. The attention to detail with this dish is pretty exceptional (perfectly fried pristine fish, lovely shallot? sauce, creamy chips, etc.). Pigmon - you beat me to it. I love the fish n chips from Pleasant House Bakery. I should really post more often, but I'm at this fish fry at least 3 times a month, and it's utterly spot on. Definitely worth a trip down to Bridgeport on a Friday night. That, combined with a visit to Maria's next door, make a lovely evening. Far and away my favorite fish fry in Chicago. New England Seafood Company haddock sandwich made for a nice midweek lunch, $8.95 with slaw, tarter sauce and house made chips. G Wiv wrote: New England Seafood Company haddock sandwich made for a nice midweek lunch, $8.95 with slaw, tarter sauce and house made chips. I went to New England Seafood for the first time last week, too. They are running a special on full orders of fish & chips for only $9.99 during the day. I thought the haddock was very good (I got two large pieces in my order of fish & chips), and the fries were OK, too, but seemed to be of the pre-breaded type, although the breading didn't have that artificial flavoring taste as those types of fries often do. Before there was an Irish Bar on every corner, the choices for fish and chips were pretty limited around Chicago. In my old neighborhood, around Montrose and Lincoln, Clancy's Pub began serving a great fish fry every Friday beginning around 1990 or 1991. Guiness battered cod, great slaw, bread and fries for around 5.95, all you can eat. It was wonderful eating. And eat it I did until Clancy's was sold in 2002. The Clancy's recipe was passed on to Murray's Pub, now McGill's Pub at 4553 Pulaski. The price is still right-7.50 for a large order and 8.50 for all you can eat. There are also all the other bar food regulars-good burgers, wings, etc. Nice place, great servers, user friendly prices and a good bunch of neighborhood regulars. One more name to add to the places that serve some of the best fish and chips. Very good seafood market, to go only joint. Loaded with all types of seafood and fish. Had a recent Alaskan white fish dinner that was right on! Friers on site to cook pre-breaded fish or take uncooked to go. Large selection and decent prices. Add it to the list for sure. Jan and I went to New England Seafood Company this afternoon for lunch / early dinner. We ran into Gary (G Wiv) and a couple of other LTH'ers there, Ravi and Dan (sorry, can't remember the last name). It was great to talk food with others! We started with the clam chowder and the lobster bisque. Both were excellent soups. The clam chowder was chunky with plenty of clams. The bisque was not smooth, having small chunks remaining. The only complaint about the bisque is that it was served almost nuclear hot and took quite a while to cool down enough to be able to eat it safely. But the flavor on both was great. I had the fish and chips plate. They were out of haddock and substituted pollack, which was perfectly fine. There were two pieces of fish, one somewhat average size and one very large, resulting in a really big portion of fish. The breading on the fish was perfect, crunchy but thin so that you were tasting fish and not just breading. The fries were very crispy, and again a very large portion. The dish was accompanied by good, but likely commercial, tarter sauce and a small ramikin of cole slaw. The slaw was somewhat dry, but will likely be to many people's liking, although I prefer mine really creamy. Jan had the lobster roll, which was served with the home made potato chips. There was plenty of lobster meat and the bread was grilled nicely. However, I would have to rate the sandwich "good" and not "great. It just needed a bit more flavor, as it came off a little bland. The chips were nice and crunchy, but here again they needed a good bit of salt to be more to our liking. Overall, a really good place that we'll return to often. It's definitely the best fish and chips that I've had in a long time. Here are a couple of photos, first the fish and chips and then the lobster roll. Sorry these are so crappy, but I took them with my Blackberry, the only device I had with me. I guess I better clean the camera lens eventually.